The start of another New Year… meaning it’s time to make New Year’s Resolutions again! 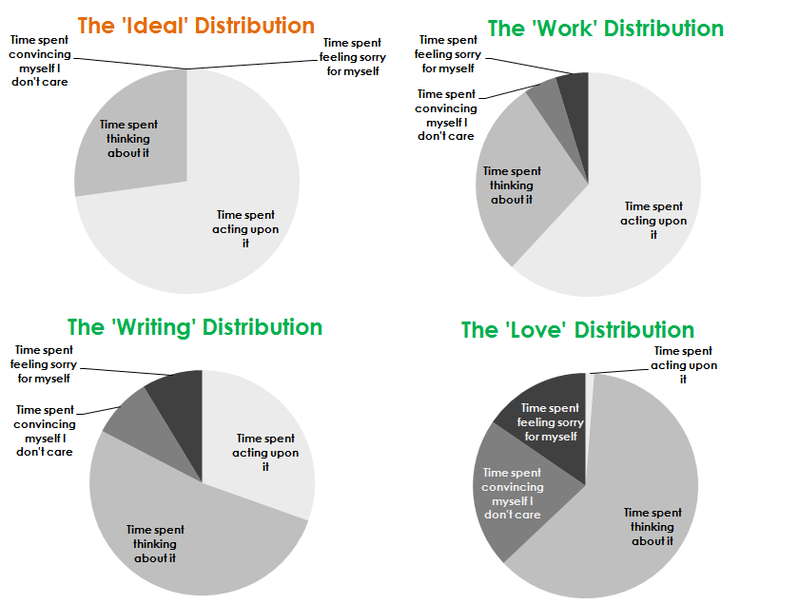 I know it’s an overdone topic, but hey, I’m desperate for any blog topic right now. The more logical part of me likes to pretend that New Year’s resolutions are just a bunch of nonsense. After all, shouldn’t self-development be a year-round activity anyway, instead of something you whip up out of a sense of unfounded optimism at the start of each year? 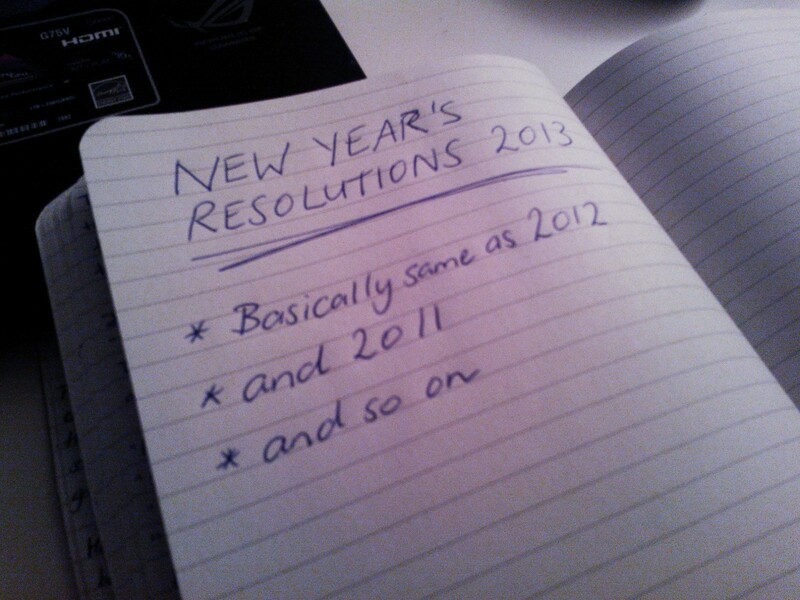 But the truth is: I love making resolutions. Maybe I’m just weird, but to me there’s something magical and therapeutic about opening my notebook to a brand-new page and start writing down things to must /want to do. I can’t really explain it. Maybe it’s just gives me the feeling that I’m working on my self-development, without well… actually working on it. I know what you are thinking right now. You’re crazy! There’s no way a normal person can achieve all these things in a single year! And the realist in me knows this. But he also knows that he has to co-exist with the dreamer in me, instead of battling against him. The dreamer in me derives much optimism and energy from absurdities such as this, and it is up to the realist to make sure that I actually sit down and work on them at some point… and also not to feel too discouraged if not everything works out perfectly. Anyway, only time will tell what 2013 will bring. At this stage I’m still very much resolved to keep my resolutions. Let’s hope this feeling stays with me for a little while longer. This is the first sentence of the acknowledgements section in Peter Ackroyd’s excellent biography on Charles Dickens. Reading through this 1000 page book it becomes clear that Ackroyd was indeed able to incorporate an amazing amount of letters and other types of written correspondence to form an as complete as possible image of Dickens. As you and I well know however, the written letter is a dying species, so I can’t help but wonder what other types of source material a historical biographer 200 years in the future would use when he wants to write about a historical figure from our own time, where a person’s entire life is practically stored in the digital cloud. On the one hand you have the obvious sources, such as e-mail, Facebook or Twitter (which makes up in pure amount of raw information what it lacks in richness), but the number of potential sources that can be used is expanding all the time. To see what else is there, I just have to look at all the different services I am using — and yes, I sometimes fantasize about being famous enough that someone would write about me in the future. Another rather obvious source is this very same blog. A lot of ready information can be obtained by reading through my posts. But also look at online services like Google Reader for instance. What RSS feeds am I subscribed to? What articles did I star? What tags did I use? There are countless other examples. What notes have I written and kept in my Evernote account? What articles have I saved in my Pocket account? What YouTube videos have I tagged as my favourites? What files have I synced in my Google Drive? What books have I bought on Amazon? What music have I listened to in Spotify? What games have I played on my XboX and when have I played them? Will people think I wasted too much time playing video games when they go through my achievement list? And of course there is the all-important question: What do all these things say about me, if anything at all? What associations and perceptions do they conjure up in other people’s minds? Privacy has become a very relevant topic during this digital age. How large a role does or should privacy play in the case of biographies? Imagine that 200 years from now a biographer would want to write a book about you: would you be ok having this stranger pry into your online records or would you have second thoughts about what to keep or what to delete (if it even helps)? Then again, is this really that much different from what happens now? Did Dickens, or other historical figures for that matter, always suspect, especially in his younger years, that future biographers would pore greedily over his every single word of every single piece of surviving written correspondence to get a glimpse of the details of his private life and personality so that it is subject for the entire world to see? Would he have been more careful with his words? Interesting questions for sure. Now if you don’t mind, I’m off to find some intelligent and sophisticated articles on the Internet to save them to my Evernote account. And I guess it’s time to delete all those Backstreet Boys songs from my Spotify account and replace them by Chopin and Mozart. When I left for the writing workshop and retreat at Limnisa on the Greek peninsula of Methana two weeks ago, I was hoping that the trip would give me new inspiration to work on my writing. However, me being who I am, I was also overcome with feelings of anxiety and apprehension. What if, despite these ideal circumstances, my mind remains trapped within this barren landscape devoid of ideas and fantasies and I still am not able to make any significant progress with my writing? Am I then forced to conclude that the noble art of writing is not suitable for one the likes of me after all? And what if I can’t get along with the other people, or more likely, what if they can’t get along with me because I’m being such a bore? Sigh… in other words I was overcome by the same worries that always trouble me no matter what I’m doing. You would have thought I would have learnt by now. Fortunately, these worries did not offset my initial enthusiasm, and with the power of hindsight, I can now safely say that these were completely unwarranted, and that the last two weeks have exceeded even my wildest expectations. My loyal companion, my dedicated friend. For as long as I can remember you have always been there for me. Throughout the years you have always stuck with me no matter what. I must admit that I did not always appreciate your presence. At times I felt that you dragged me down and that you stood in the way of my personal development. I looked down upon you in disdain and I’ve often tried my best to shut you out of my life. I did not want you hanging around me with your overwhelming influence and melancholic demeanor. No, what I craved for, what I thought I really wanted, was the attention of Happiness and Love. They were fun and popular. They were the cool kids that everyone wanted to hang out with. If only they would accept me within their inner circle, I thought to myself, then my life would become richer and more satisfying. Alas, Happiness and Love did not deem me worthy enough to step into their circle. So I sought to change myself. I strove to become a better person, whatever the hell that may mean. I tried to conform to their standards, their expectations, all in a desperate attempt to prove that I am worthy for their attention. I failed of course. Miserably. But then again, could there really have been another outcome? How can I possibly succeed when I could only think of changing who I am? When I returned to you, you were there to welcome me back with open arms. You did not chastise me for my shallowness. You did not blame me for shunning you in the first place. Instead you merely embraced me with silent understanding. All the more unforgivable then that I turned my back upon you once again. You were not good enough for me, and this time I sought my refuge with a different crowd. I started to hang out with those dangerous types like Indifference and Resentment. After the sadness and the disillusionment I had felt, their philosophies upon the world appealed greatly to me. They whispered at me that nothing else in the world matters except ourselves, and that we should always only look out for ourselves, first and foremost. They took great relish in badmouthing Happiness and Love, much to my delight. Once again, I lost sight of who I am, and I fooled myself into a state of non-caring, and that feeling empowered me. It made me feel like a big man. Just in time you pulled me out of that environment through your everlasting presence. As I look back, I shudder to think what would have become of me had I kept associating myself with Indifference and Resentment. I thought their words strengthened me, but in reality they were just leading me further down along a negative spiral. And I always thought your presence weakened me, but in reality it is you who kept me sane and lent me strength. After all, it is you who reminds me that I am only human after all, that I’m just an imperfect blob of flesh and blood just like everyone else. I always thought that feeling lonely was a great sin, but I realize now that feeling lonely does not mean that I am a failure nor does it mean that I am forever destined to be alone. On the contrary, I realize now that feeling lonely means nothing more than that I care deeply, for better or worse, and in the end, isn’t that the only thing that truly matters? Ah, my dear sweet Loneliness, we have been together so long, that I cannot even start to imagine a life where you no longer exist. I know now that you will never ever truly disappear from my life. However, there may come a time when I start to yearn for greener pastures once more, so that our grips upon one another may loosen again, but I also know you will always be there waiting inside me, within the deepest and darkest recesses of my heart, ready to embrace and welcome me whenever I have need of you again. And for that I am deeply grateful. Forever and always. I have struggled a lot with feelings of anxiety during the past few months. Lately I’m slowly getting back to the belief that anxiety is not an affliction but is very much a part of ourselves, a sign that we actually care deeply about something (partly thanks to this article). So in light of this, and highly inspired by the charts from the brilliant Elisabeth Fosslien (here and here), I decided to poke a little bit of geeky fun at my feelings of anxiety by creating some charts that express them. Sometimes a little bit of humour is the best remedy against feeling sorry for myself. 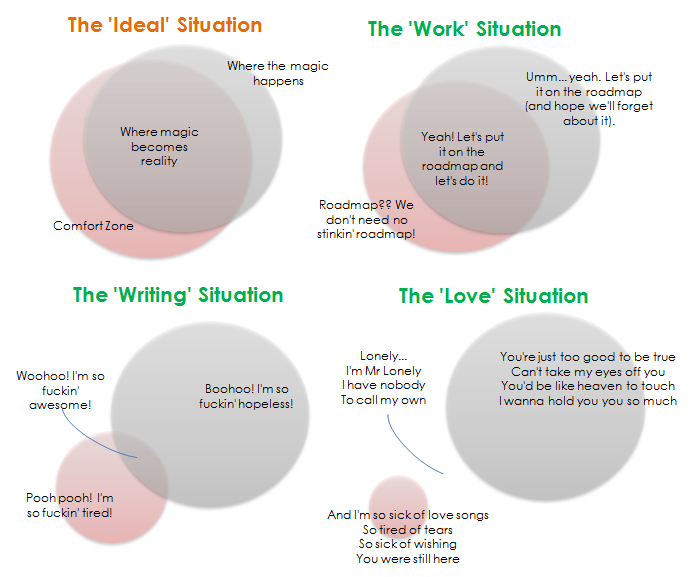 How it works is that there I always first show the ‘ideal’ situation, after which I show the actual situation in 3 important areas of my life: work, writing and love. The point is that the actual situations often deviate quite sharply from the ideal situation. The actual situations are not fixed however. 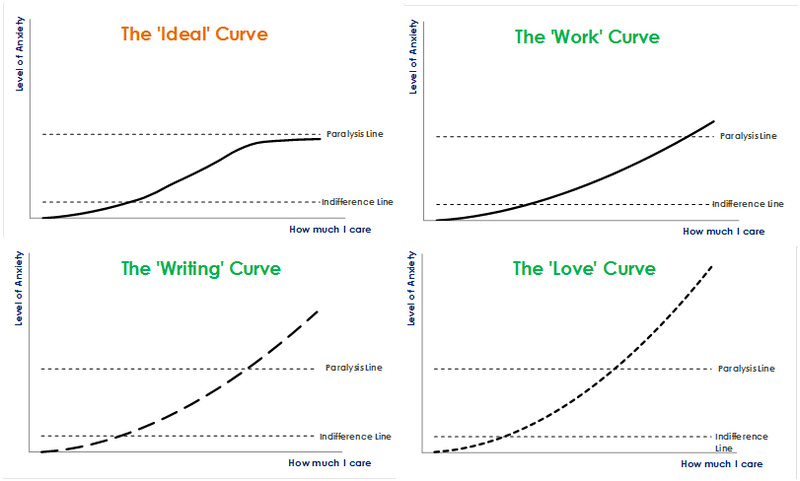 Through personal development and life experience, we hope to approach the ideal curve in the end. P.S. Click on the charts for a larger view. What is the Correlation Between Passion and Anxiety? Someone shared this diagram on Facebook the other day. As much as I like this diagram, for my own purposes I’m going to look at it in a slightly different way. I like to imagine that we are able to expand and move our comfort zone as part of our personal development. 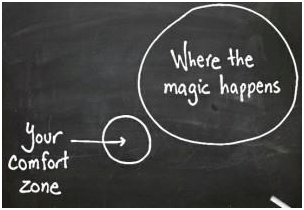 Where our comfort zone overlaps with the magical stuff, that’s where magic becomes reality. I also want to extend the concept of the comfort zone to include the state where you (pretend to) stop caring anymore in order to get rid of your feelings of anxiety.